A great choice for a holiday in Devon Welcome Family offers you a wide range of accommodation and all the amenities of a large holiday centre  with the friendliness of a small park. Cofton is set in a peaceful valley offering eighty acres of Devon countryside to explore. 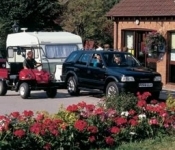 With rolling meadows, open parkland, mature woods and fishing lakes within the grounds, you'll struggle to find a more beautiful setting for your holiday.We offer a wide range of accommodation options to suit all budgets including caravan and camping, holiday homes, cottages and luxury apartments.